I have a special relationship with snow. I grew up in Canada with more snow than most sane people can handle. And I loved it. I love the smell of snow, the look of snow, snow games and snow treats. I love building things with snow and getting frozen solid, because when you’re frozen solid, you need cocoa to thaw you out. My current morning alarm tone is the song “Let it Snow!” and every single morning when I hear it, my heart skips a beat excitedly, and then I feel let down and musically lied to. Of course it’s not snowing. It almost never snows here. I know I’m not unique. Nearly everyone dreams of a White Christmas. I’m certainly not the only one in my family who loves snow. My kids love it so much that they become enraged whenever it doesn’t snow. That’s a lot of days of rage, living in the rain capital of the US. As much as Magoo loves snow, he hates those who would seek to destroy it. People who don’t let your newly potty trained 3-year-old cut in line at a public restroom? I think. Voldemort? “Yeah. Those guys are the worst.” He shakes his head with disgust. They are pretty nasty. It’s as though they don’t even like fun. Or joy. Or the laughter of children. I bet if you looked deep into their eyes, you’d find nothing but a cheerless void. And then you’d turn to stone. Never to drink hot cocoa again. 1. Firefighters, the guys who steal all the fire from our houses. These clowns are so bad, they even go out of their way to prevent fires from happening in the first place. 3. The city maintenance workers who slash and destroy all the delicious blackberry vines that grow across the sidewalks. 4. Chiropractors. Don’t even get me started on chiropractors. This post has been in my heart and on my mind for over a year now. I’ve talked about it. I’ve prayed about it. I’ve taught about it. I was waiting for the right time to post about it and now feels like that time. It’s a post about a tiny little moment that completely changed the way I see myself and others. As I think about it and act on what I learned, I find that I am changed in significant ways every single day. It was a sunny school morning and I was walking Magoo to the bus stop. I don’t often walk him to the school bus. He’s in second grade and pretty independent and I’m usually busy getting myself and his sisters ready. I’m semi-nocturnal and I sleep later than I should most mornings. When it’s time for school, he says goodbye and heads up the hill to the bus. As we got half way to the bus, Magoo reached out and grabbed my hand in an uninhibited way that I knew wouldn’t happen many more times. He’s seven now but growing and how many 12-year-old boys do you see still swinging hands happily with their mommies? I squeezed his hand, felt the rare Seattle sun on my face, and told him I loved him. I was nearly perfectly happy. Just at that moment, the thought came into my mind, That’s awesome that you’re walking him to the bus stop and putting on this “mother of the year” act today. What about yesterday and the day before that? You hardly ever walk him to the bus. He’s probably holding your hand because he’s so desperate for the love and attention you haven’t been showing him. My bubble had burst. I am a crap mom, I thought, as I looked down into his smiling face. Then another thought came. Kathryn. What is wrong with you? You are being an awesome mom in this moment. Your child is happy. You are loving him and caring for him. He’s well fed and dressed. You’re walking to the bus stop in the early morning and you’re already wearing a bra for heck’s sake. Do not rob yourself of this moment’s joy because of what you failed to do yesterday or what you fear you might not do tomorrow. You’re worshiping in the temple? Woopty freakin do! How long has it been since you came here last? When are you likely to come again? You’re not good at this. This is a fluke. Wow. So you cleaned the kitchen today. Want a cookie? That dirty rag has been on the counter for a week and those dishes you so righteously cleaned are from breakfast three days ago. You are embarrassing. That was really nice of you to offer to watch your friend’s kids while she had surgery. Remember last week when you knew your neighbor was suffering from depression and you drove right by with a wave because you did not want to get sucked into the drama? You don’t really care about people. Not all the time. How destructive are these kinds of thoughts? As I said goodbye to Magoo and started to walk back home, my mind started to shift. Drops of Awesome! I thought. Every time you do something good, something kind, something productive, it’s a drop in your Bucket of Awesome. You don’t lose drops for every misstep. You can only build. You can only fill. I walked Magoo to the bus. Drop of Awesome! All day long I chanted these words in my head. I picked up that tootsie roll wrapper off the front porch instead of stepping over it for the eleventy hundredth time. Drop of Awesome! I unloaded one dish from the dishwasher when I walked through the kitchen on my way to the bathroom. Drop of Awesome! I texted my sad neighbor to say I was thinking about her. Drop of Awesome! I had a critical thought about one of my kids and I brushed it away and replaced it with love. Drop of Awesome! When I started thinking about my life in terms of adding these little Drops of Awesome for every tiny act of good, I found that I was doing more and more of them because it’s a lot more fun to do good when you’re rewarded with joy, rather than being guilted about every failure in your past. By the end of the day, I had realized something important. If I was spending time with my kids, really listening to them with attention in the moment, then I was a good listener, regardless of the 50 other times I’d brushed them off or multi-tasked while they were talking over the past week. If I was engaged in sincere prayer with my Heavenly Father, really communing with him and seeking his will, then I was a person who engages in sincere prayer, regardless of how my prayers were (or weren’t) yesterday and the day before that and the day before that. As I added up these Drops of Awesome, I found that in those moments I actually became the person I had always wanted to be. These things are lies, depending on the next decision you make, the next Drop of Awesome you put in your bucket. You may have done these things or have a hard time with them but they don’t define you and you can change this very instant. You may not think you can change permanently but you can change the next choice you make. And as you change that one next tiny choice, you may think, I got this one Drop of Awesome but I may never be able to get another one again. You made the right choice once. And in that moment you were the person you want to be and that is a triumph. For one night, you were a person who went to bed early. One morning you woke up and the first words out of your mouth were positive so you were a morning person in that moment. Bam! Drop of Awesome. Now, there are a whole lot of religious implications to this because, as a Christian, I believe that you are not the only one adding these Drops of Awesome to your bucket. Christ commanded us to be perfect, but through His atonement, He is with us every step of the way. As an object lesson when I was teaching this to the teenage girls at church, I gave them each a small dropper and I put a 2-quart bowl on the table. I told them that throughout the lesson they would get the chance to put drops in the bucket for every Drop of Awesome they could think of that they’d done. I promised them that we would fill the bowl to overflowing by the end of the lesson. With about 5 minutes to go, we had barely begun to fill the bowl and the girls were looking around at each other nervously. The promised overflow did not look likely. Were they not awesome enough? At that point, I pulled out a large pitcher labeled ATONEMENT and poured water into the glass bowl until it was spilling out all over the table and the towel the bowl was resting on. The class went silent. I believe in a God who loves us and roots for us and cheers for every Drop of Awesome we can manage. Our victories are His victories and He wants us to feel joy. Not later, when we no longer make mistakes, but right now. Small and simple. Tiny drops. Go forth. Be Awesome. 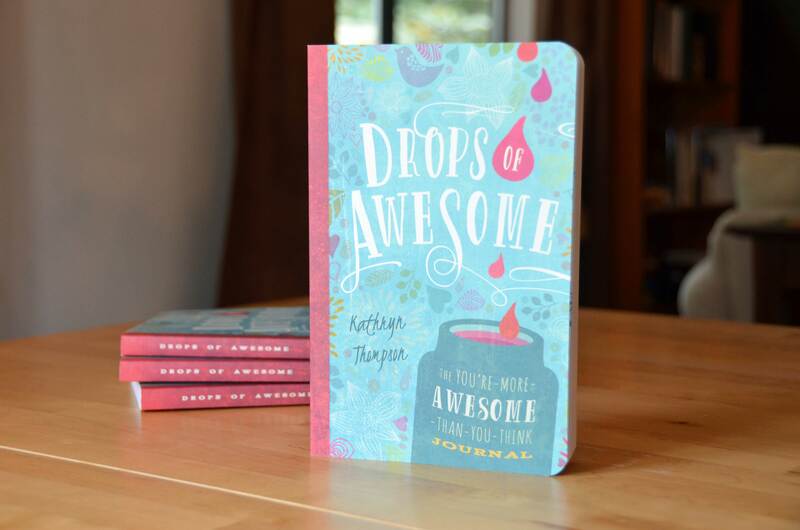 The Drops of Awesome: You’re-More-Awesome-Than-You-Think Journal is now available from Amazon. Collect your drops! Also help yourself remember to recognize your small victories with a Drops of Awesome wristband. I was surprised to see so many humans inside Target. The requirements for admittance are clearly marked. Julie Meulemans has posted some great ways you can directly help the survivors and families affected by last week’s unspeakable events. Please pop over there and see if there’s something you can do. What do you do when the world seems full of darkness? Fill it with light. I had the talk with my kids today – the “bad people exist and there’s nothing we can do about them but there’s something we can do about us” talk. I’d say it went well. I was the only one who cried and no one vomited and they’re currently asleep safe in their beds, hopefully with dreams of sugarplums in their little noggins. I wanted them to hear about Connecticut from me, not from their friends at school. Today’s massacre makes me sad and sick and steers me toward hopeless. But after getting advice from my wise sister, I told my kids what I needed to hear. We cannot change other people. We can love them. We can pray for them. But we cannot control their decisions. We can only control our own. So for every crazy, merciless, mentally ill terrorist who destroys life, and light, and innocence in this world, for every act of darkness, I need to do a thousand acts of light. The only way we win is by living better, by pushing back harder, by loving, and by nurturing in tiny and slightly less tiny ways and then repeating. Darkness only wins when the good people of the world stop generating light. For every bully who tears someone down, I will build up 10 people. For every guy that cuts someone off in traffic, I will let three people go ahead of me. For every senseless act of violence, I will perpetrate enough acts of love and beauty to help me start to forget the sharp pang of first hearing about it. The ache will never fully go away. But that’s okay. The ache is a reminder of how much work there is for me to do. If I am part of the light, I need to commit every day to shine brighter, to love stronger. We can never. Ever. Give up. We can never let Sandy Hook be the world we live in. It’s not even an option. 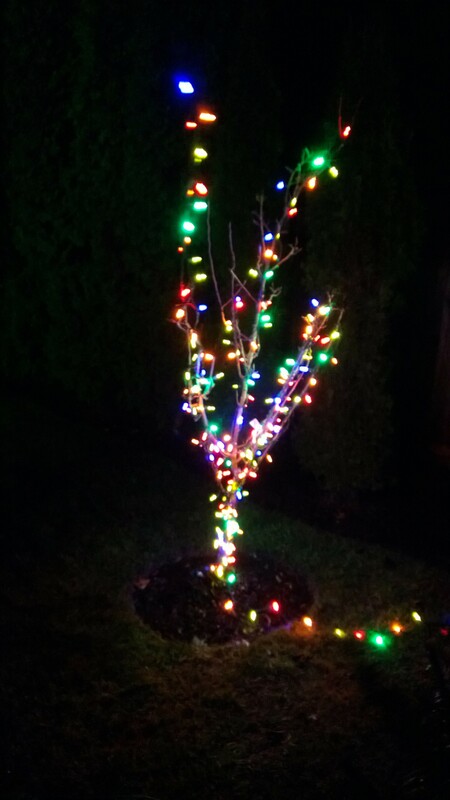 This year I became obsessed with wrapping this tiny pear tree with lights. Three strands and an hour later, I ended up with something that looks like Charlie Brown got a visit from the Temple Square fairy. It’s highly possible that the lumberjack fairy will bless it in January when I don’t have remotely enough patience to untangle the world’s worst yarn knot.